The source file: /homepages/36/d364800923/htdocs/phs/images/igallery/original/401-500/photo_4-452.jpg does not exist, please delete/reupload this image. Members of Polish Heritage Society and Polish veterans were amongst more than 9,000 former servicemen and civilian volunteers joining the march down Whitehall, to the applause of thousands of spectators, young and old, lining the central London streets. The march-past in brilliant winter sunshine taking almost an hour to pass the Centotaph. 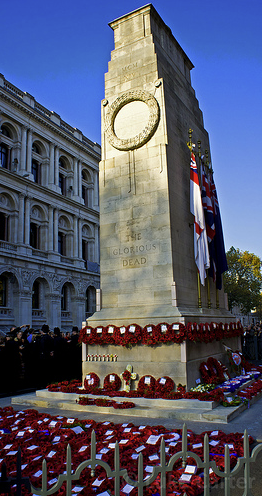 The Queen was the first to lay a wreath at the Cenotaph, followed by other members of the Royal Family, Prime Minister David Cameron, Liberal Democrat leader Nick Clegg, and opposition leader Ed Miliband along with other political figures and representatives of the Commonwealth countries. Dr. Marek Stella-Sawicki, Chairman of the Polish Heritage Society UK, laid a wreath on behalf of the PHS commemorating the Polish Land, Sea, Air and Polish Underground Armed Forces who sacrificed their lives 'For Your Freedom and Ours' during the Second World War. 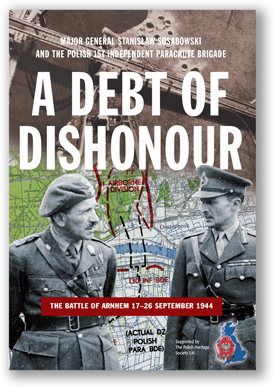 Poland was the only Allied country to fight in the European Theatre of War from the first day of the war until the last, almost six years later. Polish men and women gave their lives on many fronts—on land, at sea and in the air, where they distinguished themselves with courage and self-sacrifice at Westerplatte, Warsaw, Narvik, the Battle of the Atlantic, Tobruk, Monte Cassino, Normandy, Wilhelmshaven, Caen, Arnhem, Berlin and by the Home Army in Poland. They also provided the Allies with the means to break the German Enigma cipher machines, as well as vital intelligence that allowed the Allies to get their hands on secrets of the of the V-1 flying bomb and the V-2 rocket, as well as even actual V-2 parts. A memorial to the Polish Armed Forces was unveiled by HRH The Duke of Kent, KG at the National Memorial Arboretum in September 2009 to provide a focus for the continued remembrance of the valour of the many Polish military and civilian organisations involved in the Second World War .